Affecting about two of every 1,000 people, absence seizures (formerly called ''petit mal'' seizures) are caused by abnormal and intense electrical activity in the brain. Normally, the brain's nerve cells (neurons) communicate with one another by firing tiny electric signals. But with a seizure, these signals become abnormal. Seizures may affect an isolated part of the brain or may involve abnormal activity in the whole brain (called generalized seizures). 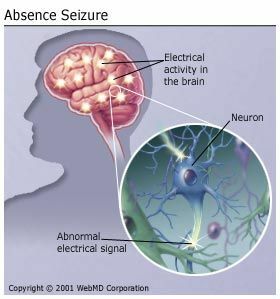 Absence seizures are one form of generalized seizure. Typically, this type of seizure lasts between 10 and 30 seconds. The person, most often a child aged 5 to 15, abruptly stops whatever he's doing (talking, walking) and appears to "stare into space." Absence seizures rarely cause a true convulsion in which the person falls down or collapses. Despite briefly losing consciousness, the person recovers fully with no lingering confusion or other ill effects. These "spells" may occur infrequently or several times per hour. In children, absence seizures may interfere with learning and are often misinterpreted as daydreaming or inattention. About a quarter of people who have absence seizures will develop another type of generalized seizure called tonic-clonic seizures (formerly called ''grand mal'' seizures). The vast majority of children, however, will outgrow them. Scientists are unsure of the underlying reasons for absence seizures; however, some research suggests that genetics may play a role. Mattson R.Overview: Idiopathic Generalized Epilepsies, Epilepsia, 2003.